March 7-8 is National Day of Unplugging | Most of us have our iPhone/SmartPhone attached to our hand like an extra appendage (guilty as charged). But get this: For 24 hours pledge to turn off your devices (gasp!). Devices like your beloved iPad and iPod, TV, computer, ignore your text messages and emails, put down your game station controller…you get the idea. Unplug to reconnect with real live humans! Do something other than plugging in, looking at a screen. If it’s nice outside (which it isn’t here and I envy you) take a walk and get some fresh air. My kids love to play the card game Uno, so maybe we’ll play several rounds until one of them cries because she lost…again. Then, we’ll watch a movie. Do something F-U-N with the ones you love! Okay, some of you are working today and not using the Internet or your cell phone just isn’t realistic. I get it. The point is to unplug when you can. Unplug this evening when you get home from work, or unplug on Saturday. Plug into your family, plug into life. ALSO, March 8th is International Women’s Day | “Inspiring women & celebrating achievements” of women everywhere. The idea behind this day is to inspire us to do our part to help ensure the bright future of girls in our little part of the world, and/or elsewhere. “Make a difference, think globally, and act locally.” Do you have an idea to help women/girls in your hometown, in another part of the world? (I do and I will be sharing that idea soon.) Don’t just sit there, do something. It all starts with one idea. You just have to start somewhere. Find out more here. St. Patrick’s Day in March 17th | I am telling you this ahead of time so you don’t get pinched…paint your nails! 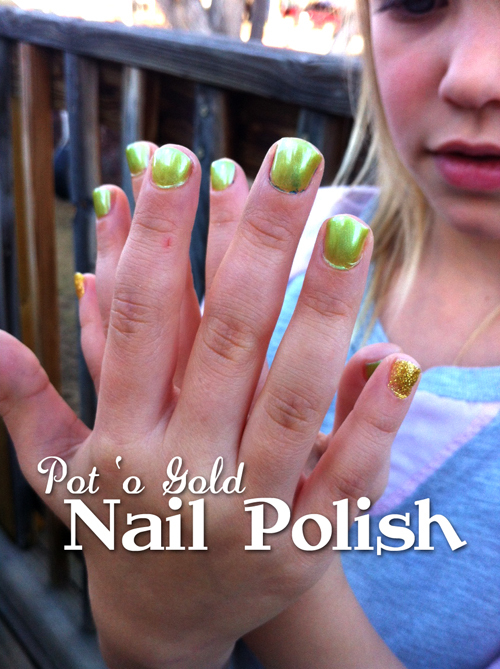 Paint four nails on each hand a pretty shamrock green; paint one nail on each hand pot ‘o gold. Viola! No pinching. May a you have a blessed weekend filled with connecting with those you love. However you choose to connect…leave a comment below to let me know. I’m unplugging March 8/9 since I have some commitments that require me to plug in part of tomorrow, and because I had no idea there was ANY such thing. So thank you. I’ll be unplugging.